The trail is part of Gateway Valley, an area now known as Wilder, located south of Highway 24 and just east of the Caldecott Tunnel. The area is critical wildlife habitat – a key link in the north-south wildlife corridor that runs from Wildcat Canyon to Lake Chabot. Thanks to GGAS’s expertise, counsel, and resources, over 1,300 strategically-located acres of Gateway Valley were added to our protected wildlands. The story began in the 1980s, as open spaces around the Bay Area came under increasing development pressure. The northern reaches of Gateway Valley — across Highway 24 from the California Shakespeare Theater — belonged to Ed Daly, owner of World Airways, known for its government contracts during the Vietnam war. Daly was supposedly in the process of donating his land to the East Bay Regional Park District when he passed away in 1984. His family then sold it to a development group, setting the stage for years of contention. With the later addition of land to the south owned by Daly’s financial officer, the total project area was 978 acres. Homes were the main focus but a 27-hole golf course was included in every proposal until a settlement was ultimately reached, driven by GGAS. Despite its prime location, the valley had not been developed in prior decades for a good reason. The hillsides were unstable, and studies revealed problems even deeper than expected, with hidden landslides in the underlying bedrock. The extensive grading and drainage needed to support roads and construction could not be done without destroying existing creeks, wetlands, and seeps, and numerous old growth trees, a variety of habitats home to species including endangered California Red-legged Frogs and Alameda Whipsnakes, as well as majestic Golden Eagles. The valley’s natural attributes made it a resource of national importance. This was significant, because it meant that, in addition to obtaining approval by the City of Orinda, any development had to be also vetted by state and federal environmental agencies, a process coordinated by the U.S. Army Corps of Engineers that provided numerous opportunities to advocate for the environment. Opposition to the development plan in Orinda was widespread and well organized. Residents formed a group called Save Open Space – Gateway Valley (“SOS”). A 300-copy, four-page publication explaining the issue and arguing for preservation grew into a newletter, the Golden Eagle, with 6,000 copies distributed monthly by 125 citizens in their neighborhoods for years. Local citizens and representatives of environmental groups, including Golden Gate Aububon, spoke at the numerous public meetings and wrote constantly to the relevant government bodies. Oak woodlands along the McCosker Loop Trail. Photo by William Hudson. One of the residents of the Wilder/Gateway Valley area. Photo by William Hudson. The SOS-led opposition managed to halt plans by three successive development groups between 1987 and 2002, including, in 1994, overturning by referendum the Orinda City Council’s approval of 425 homes, a 27-hole golf course and massive regional hotel conference center. Then, in 2002, Farallon Capital Management acquired the development rights to the Gateway area. Farallon approached GGAS’s Executive Director, Arthur Feinstein, and asked him to bring SOS into discussions towards a compromise. Farallon was familiar with Arthur’s successful track record in brokering similar agreements elsewhere. On the strength of Arthur’s role as one of their closest and longest-term advisors, SOS joined GGAS and the Sierra Club at the negotiating table with Farallon. 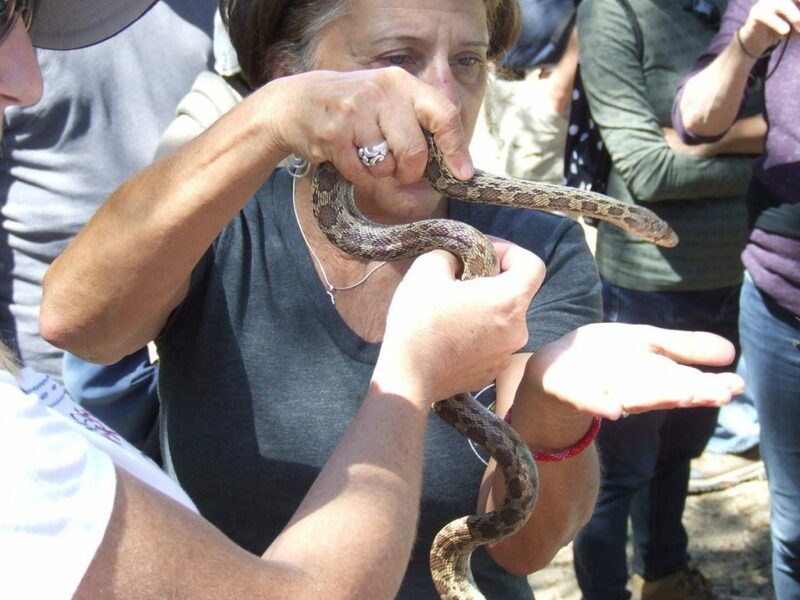 GGAS also provided a second necessary ingredient – funding for the attorney who represented the conservation alliance during two years of bargaining. The effort was successful. The conservationists agreed not to oppose 245 houses together with playfields, roads, etc. on 230 acres. Farallon eliminated the golf course, agreed to permanent protection for over 1,300 acres (the balance of the 978 acres plus adjacent land acquired for mitigation in previous years), and provided for $1 million in funds for additional conservation. Removal of the golf course significantly reduced habitat disruption from grading. For example, some efforts to preserve existing watercourses could be done by working between them, and work did not have to take place as high up the hillsides as initially proposed. Responsibility for the 1,300 protected acres was subsequently assumed by the East Bay Municipal Utility District, the East Bay Regional Park District, and a small Geologic Hazard Abatement District funded by Wilder homeowners. This map shows the Gateway Valley/ Wilder area. The colored portion of the map is Contra Costa County, while Oakland is gray. The white lines show the north-south wildlife corridor of which Wilder is now a key part. 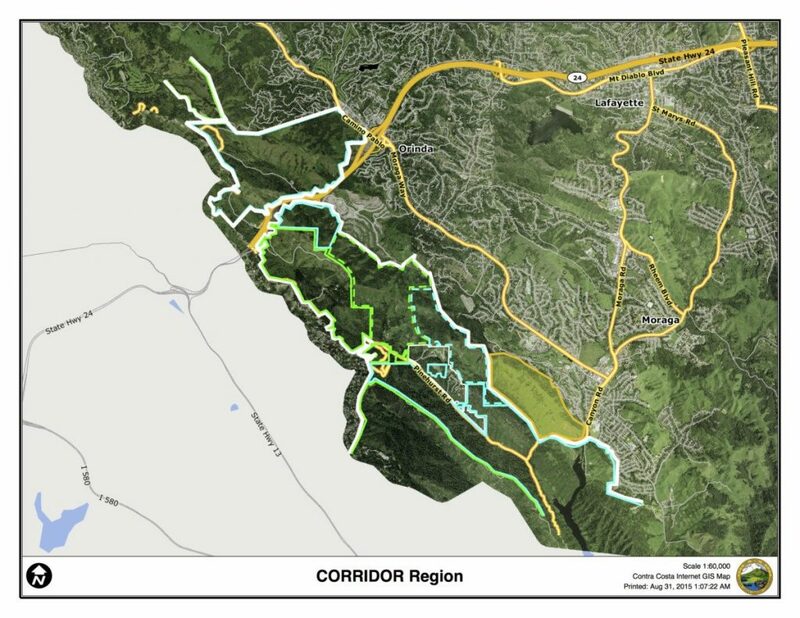 The green and blue dashes enclose the 1,300 acres: Blue is now managed by EBMUD, while green is managed by EBRPD. Mt. Diablo can be seen in the distance from the McCosker Loop Trail. Photo by William Hudson. Along the McCosker Loop Trail. The hills in the distance are the Western Hills area. Photo by William Hudson. 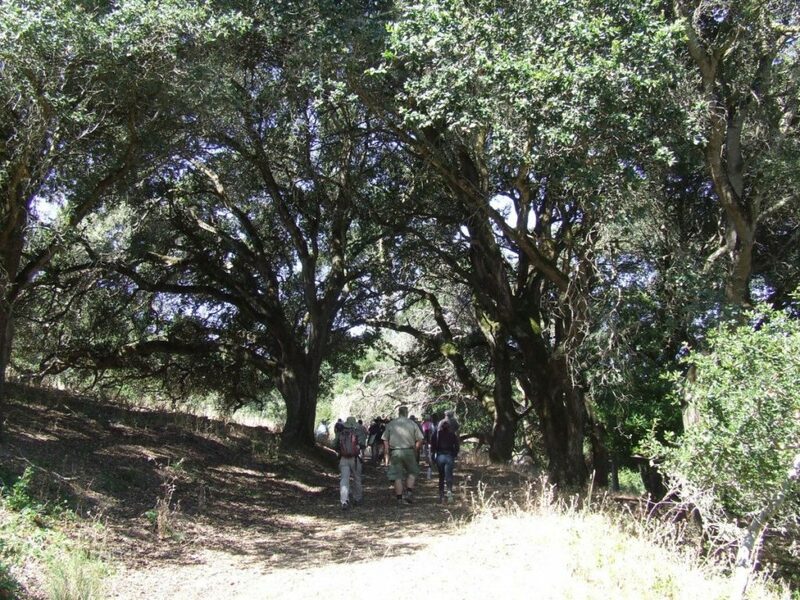 Today EBRPD’s share is 640 acres that are in the early stages of annexation to Sibley Volcanic Regional Preserve. The McCosker Parcel, a 250-acre former quarry, was partially opened this spring with access to the two-mile McCosker Loop Trail. 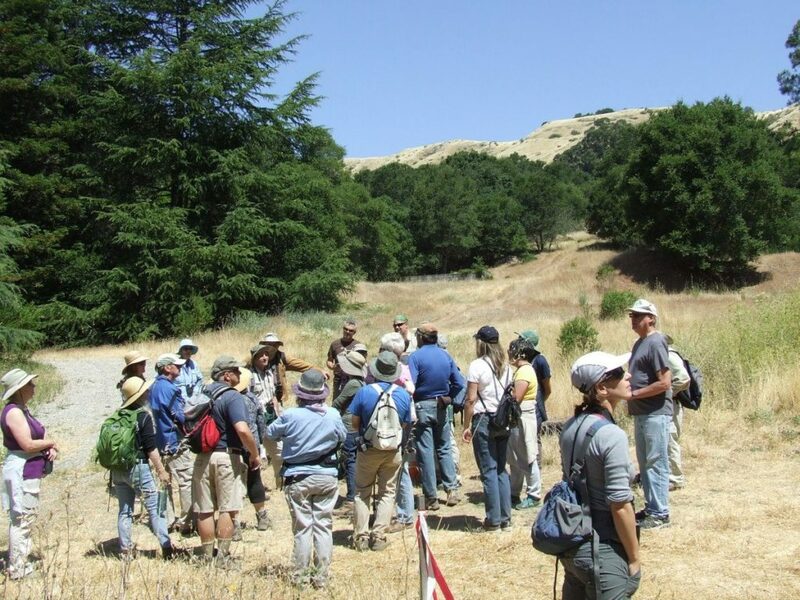 And, following a series of public meetings last year, EBRPD is developing an integrated plan for McCosker and the remaining 390 acres, know as the Western Hills Open Space. The McCosker Loop Trail may be only two miles long… but it was thirty years in the making. And preservation of those 1,300 wild acres is one of the proudest achievements of Golden Gate Audubon’s first century. Join William Hudson, Arthur Feinstein, and GGAS birding instructor Bob Lewis on a special GGAS Centennial field trip to the McCosker Loop Trail on Sunday, October 22, 2017. Experience this important habitat and learn about its history firsthand! See our Field Trips web page for details and directions. William Hudson was an early volunteer and later board member for Save Open Space-Gateway Valley, and is currently treasurer of the Gateway Settlement Fund Alliance, a related organization with representatives from SOS-GV, Golden Gate Audubon Society, and the Sierra Club. He is also on the board of Golden Gate Audubon.